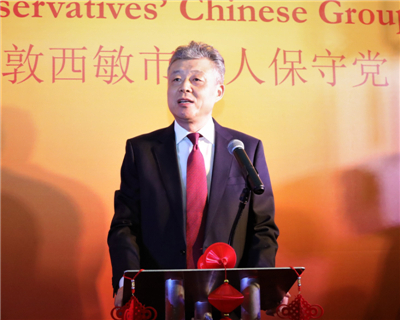 On February 11, Ambassador Liu Xiaoming attended the Chinese New Year Dinner 2019 hosted by the Cities of London and Westminster Conservative Association (CLWCA). About 200 people from British government, Parliament, industry and business, culture, education and media sectors were present, including the Rt Hon. Mark Field MP, FCO Minister of State for Asia and the Pacific, the Rt Hon. 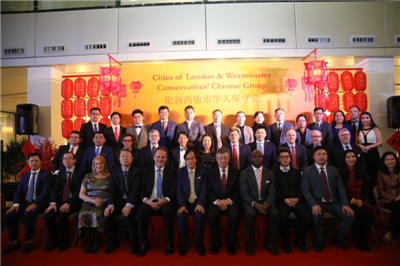 Lord Wei Miny-Yan, Thomas Davies, Chairman of the CLWCA, and Tony Ip, Chairman of the CLWCA Chinese Group, and representatives of overseas Chinese. Ambassador Liu delivered a speech entitled Cement the Foundation for the Edifice of China-UK Relations. 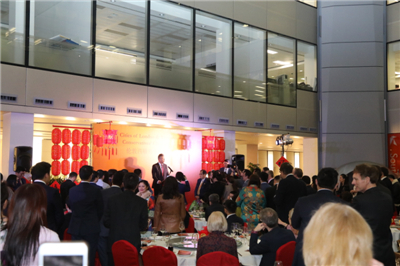 He noted that in recent days, the Chinese New Year is celebrated across the UK, from the government to the Parliament, from political parties to businesses, and from schools to communities. It is increasingly becoming a festival for both the Chinese and British people. Since 2018, China-UK relations have continued to grow, yielding fruitful results in cooperation, closing the ties between the people of the two countries and enhancing the coordination on international affairs. “In 2019, China will celebrate the 70th anniversary of the founding of the People’s Republic. China and the UK will celebrate the 65th anniversary of the establishment of diplomatic relationship at the level of chargé d’affaires”, the Ambassador said. 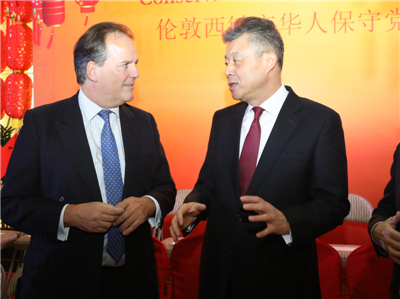 He had three hopes for China-UK relations in the new year. The first hope is that China and the UK should look at each other’s development as opportunities, respect each other’s sovereignty, security and right to development, handle the differences properly, and continuously enhance strategic mutual trust so as to strengthen the foundation of China-UK relations. The second hope is that the two countries should advocate free trade, oppose protectionism, maximize the synergy between the development strategies, deepen cooperation in various fields, and work together to promote an open world economy. The UK, at the same time, would continue to provide a fair, transparent and non-discriminatory business environment for Chinese companies. The third hope is that the two sides should continue to enhance cultural and people-to-people exchanges, deepen mutual understanding and friendship, strengthen mutual learning between the Chinese and Western culture, and set a good example of harmonious coexistence of different civilizations. 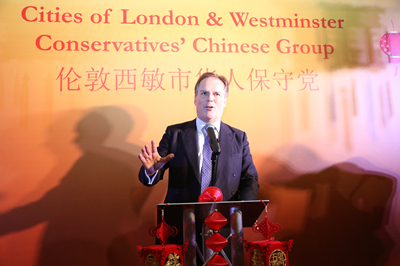 Minister Field said in his speech that in recent years, China-UK relationship has been in a “Golden Era” with rapid development, remarkable results of cooperation in various fields and ever closer people-to-people and cultural exchanges. Chinese in Britain are playing an important role in promoting the development of China-UK relations. He hoped that the great number of Chinese students in the UK would help facilitate the friendly cooperation in economic and trade between the two countries after they finish their study and return to China. In a warm and friendly atmosphere, the guests talked about China-UK friendly exchanges and cooperation, hoping that the China-UK “Golden Era” would be strong and enduring, and bring more benefits to the people of the two countries.